PT Pelabuhan Indonesia I (Persero) - Pelindo I Group or widely known as Inaport 1 is a leading state-owned company in Indonesia, based in Medan North Sumatera and engaged in port management services. Inaport 1 operates primarily as a port operator in the western part of Indonesia which covers 4 provinces, namely Aceh, North Sumatera, Riau and Riau Islands. PT Pelabuhan Indonesia I (Persero) is a non listed state-owned company and is fully-owned by the Government of Indonesia. As of December 2015, Inaport 1 runs its business through 14 port branch offices, 1 representative office, 11 port areas and 4 working units. 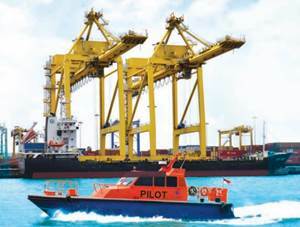 The state-owned port operator also supported by 4 subsidiary and affilated companies, namely PT Prima Indonesia Logistik, PT Prima Pengembangan Kawasan, PT Prima Terminal Petikemas, and PT Prima Multi Terminal. In term of financial performance, PT Pelabuhan Indonesia I (Persero) succeeded in posting excellent financial performance in 2015. Pelindo I Group successfully recorded a total revenue of Rp 2,340.72 billion, according to PT Pelabuhan Indonesia I (Persero) Annual Report 2015 as cited by JobsCDC.com. This total revenue figure reflected an 11.70% increaseg from Rp 2,095.52 billion in 2014. Total current year profit in 2015 amounted to Rp 700.36 billion, booked a 30.93% growth from Rp 534.89 billlion in 2014. A minimum age of 30 years and a maximum of 45 years old per 1 December 2016. Minimum background in ANT-III which has been in accordance with the STCW 1978 amendments of 2010. Minimum 3 years of sail experience as Mualim / Helmsman Boats with minimal vessel size of GT 1000. Physically and mentally healthy and drug-free. Not color blind, do not wear glasses / optical lens, and does not have eye defects. Radar Simulator / Arpa Simulator. Electronic chart display and information system. Good character and has never caused workplace accidents while on duty. Willing to be placed in the working area of PT Pelindo I, follow the Pandu training program, and undergo a bond. Copy of certificate from the harbor master sailed as Mualim / Helmsman Boats. Statement letter/affidavit (please download here). JobsCDC.com now available on android device. Download now on Google Play here. Please be aware of recruitment fraud. The entire stage of this selection process is free of charge. PT Pelabuhan Indonesia I (Persero) - Recruitment Calon Pandu Pelindo I Group December 2016 will never ask for fees or upfront payments for any purposes during the recruitment process such as transportation and accommodation.